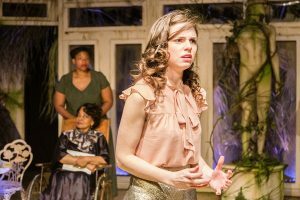 When co-artistic directors Augustin Correro and Nick Shackleford founded the Tennessee Williams Theatre Company four years ago, they insisted their intent was to bring the collected works of their namesake playwright to New Orleans stages with emphasis on his more obscure and lesser-performed titles in addition to the mainstays that audiences have come to expect. As a result, well-received plays like The Milk Train Doesn’t Stop Here Anymore, Camino Real and Kingdom of Earth were produced by Correro and Shackleford along with a troupe of dedicated and talented players, some of whom had never before performed in a Tennessee Williams play. 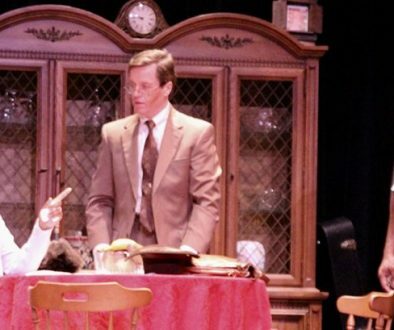 Correro has helmed most of these productions as director, while Shackleford has concentrated his efforts as a technical guru, oftentimes creating imaginative sound designs that enhance and oftentimes expand the work of the actors on stage. Gwendolyne Foxworth, a grand dame of New Orleans theatre, was the first African-American to win a Best Actress in a Play Big Easy Award four years ago, when she played Amanda Wingfield in Williams’ The Glass Menagerie. There is little doubt that Foxworth understands the poetry in Williams’ idiom. She knows how to read the spaces between the words so that a pause in a given phrase lends special accent or emphasis to the words found on the page. Her interpretation of the disarmingly charming, yet stealthily malevolent matriarch of the family, Violet Venable, is downright chilling. Venable, a resident of the New Orleans Garden District, welcomes Dr. Cukrowicz (or, as he insists the more pronounceable “Dr. Sugar”), a young and unsuspecting psychosurgeon (Matthew Raetz) to her once elegant solarium. Still mourning the loss of her beloved son Sebastian the previous summer, Venable reveals that Sebastian had died on a European tour under still mysterious circumstances. Sidelined by a stroke, the vain Venable had allowed her late husband’s niece Catherine Holly (Elizabeth McCoy) to accompany Sebastian in her stead. Her fantastic description of Sebastian’s brutal death by a flock of pecking birds leads to her being forcibly committed and a battery of tests and procedures done to get her to tell a less fanciful tale about Sebastian and, perhaps, to reveal what really happened to his mother. Violet attempts to strong-arm the doctor into performing a lobotomy on Catherine for purposes that seem more vengeful than medically warranted. 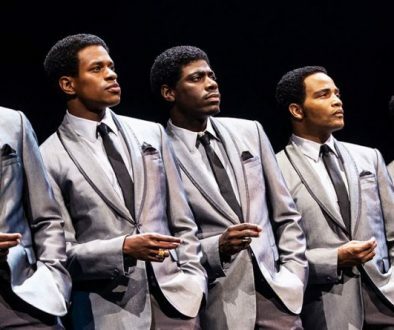 The psychological underpinning between Foxworth’s and McCoy’s characters is palpable even though they share the stage but for a limited amount of time. The sheer force of Venable’s domineering spirit hangs in the air during Catherine’s scene and her irrational, but somehow believable explanation for Sebastian’s demise is impossible to ignore when Violet is holding court. McCoy’s performance is measured and strong. 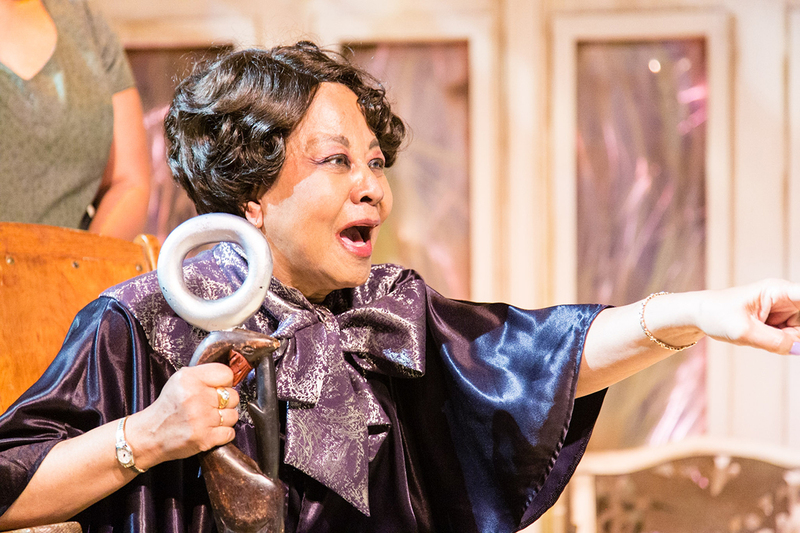 Her previous work at Le Petit’s A Christmas Carol, Dividing the Estate and A Streetcar Named Desire have all indicated she was capable of commanding a leading role. With Suddenly Last Summer, she proves it. Correro has assembled a worthy supporting cast. As Dr. Sugar, Raetz is capable and even-handed when approaching both his potential sponsor (Venable) and his likely patient (Catherine Holly). It is through his intersession that the play proceeds lest it devolve into a shouting match of accusations and recriminations. If Raetz is the voice of reason, Catherine and Violet Venable represent opposite poles of fear and hate. Ann Dalrymple is Sister Felicity, Catherine’s sitter, responsible for her troublesome young charge who, at Venable’s insistence, is on a temporary leave from the religious institution where she is being cared for. Lin Gathright as Catherine’s mother and Jay Canova as Catherine’s brother George are cloying sycophants, who are ready to throw Catherine under the bus if it means receiving their inheritance from their uncle’s estate, now tightly managed by Venable. Both Gathright and Canova are terrific actors portraying horrible characters. Bianca Siplin plays Miss Foxhill, the woman charged with taking care of Violet Venable and acting as her legs while she is confined to a wheelchair. This small part is necessary to reinforce Violet’s recovery from a stroke, which she refuses to acknowledge, and to act as a buffer between her mistress and other actors. Siplin seemed tentative in her performance, especially when viewed with such strong portrayals as that of Foxworth and McCoy. 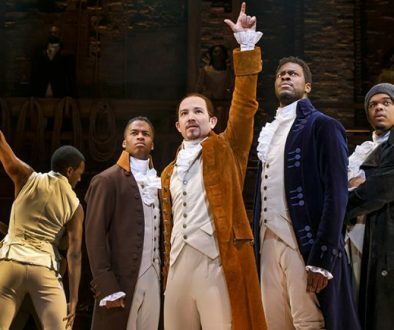 Shackleford’s sound design is absolutely integral to this production to set the mood and to add to the thrilling scenic design by Ken Thompson. Thompson magnificently recreates the solarium that Williams based on the carriage house of the House of Bultman Funeral Home on St. Charles Avenue. Lee Kyle’s costumes are also quite striking. The Tennessee Williams Theatre Company continues to demonstrate its leadership in promoting the work of the poet, playwright and screenplay writer who called New Orleans his spiritual home. 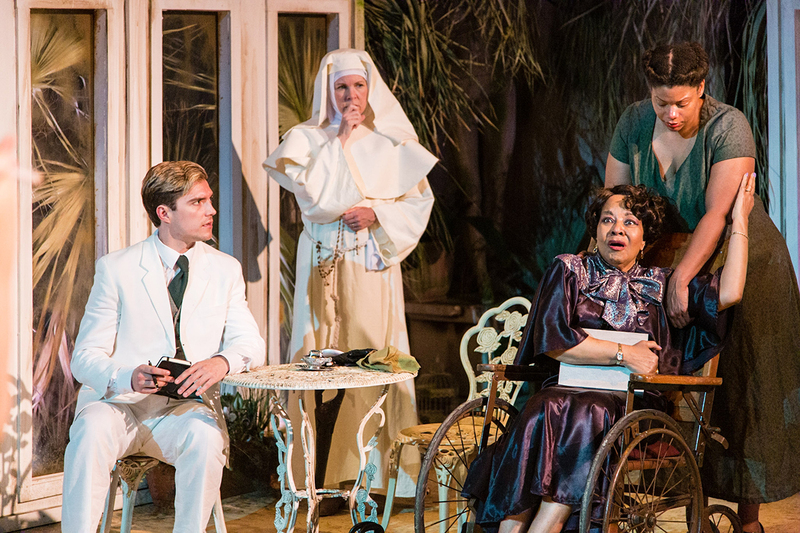 If New Orleans was indeed Tennessee’s spiritual home, then the Tennessee Williams Theatre Company is keeping that spirit alive these many years after his passing. 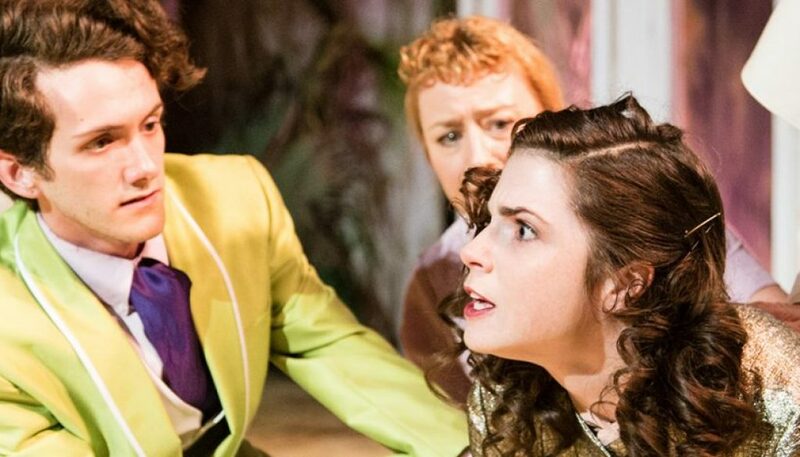 Their latest work, intentionally paired with last week’s Tennessee Williams New Orleans Literary Festival, shows they are at the top of their game and well prepared for their upcoming fifth season to bow this summer. 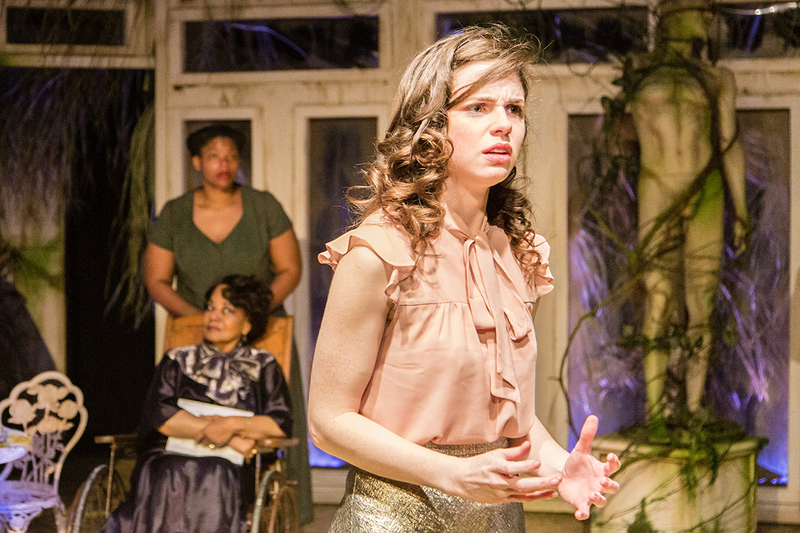 Suddenly Last Summer continues at the new permanent home of the Tennessee Williams Theatre Company of New Orleans, the Lower Depths Theater at Loyola University through April 13. Showtimes are at 8:00 p.m. and running time is approximately 90 minutes. For information call 504-264-2580 and for tickets click here.